The setting for this spectacular ancient Mayan city is splendid, a hauntingly beautiful site engulfed in the endless tropical jungle that bristles with the shriek of insects. The architecture is fantastic and for many Palenque is the most remarkable of the major Mayan sites. Early morning is the best time to capture the setting at its most photogenic, when swirling vapours encircle the temples and the jungle. 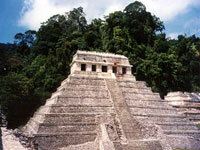 The highlight is the tallest and most important of Palenque's buildings, the magnificent Temple of Inscriptions. Constructed on eight levels, the rear interior wall is decorated with panels of Mayan hieroglyphic inscriptions describing the history of Palenque and the temple. There is a museum near the entrance of the site. Address: Four miles (6.5km) from Palenque town. Transport: Frequent minibus services from Palenque town. Opening times: Daily 8am to 4.30pm.